White kraft paper merchandise shopping bags are perfect for any retail business. The white kraft paper shopping bags come in a variety of sizes to choose from. If you cannot find exactly what you are looking for please chat online or call and one of our knowledgeable representatives will assist you with your merchandise shopping bag questions. Palay Display has been selling store fixtures and retail displays since 1945. 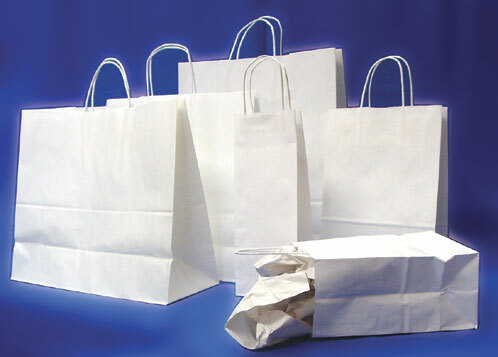 16" x 6" x 12 1/2"
8 1/4" x 4 3/4" x 10 1/2"
5 1/4" x 3 1/2" x 8 1/4"
16" x 6" x 19"
18" x 7" x 19"
White kraft shopping bags. These white kraft paper shopping bags are packaged 250 per carton.